Lighting in a bed and breakfast is of paramount importance both inside and out. Inside the B&B lighting can control ambience and help the mood. With the current trend to treat the garden as an outside room (when possible) lighting is going to be needed outside too. Then there's also a need for outdoor lighting for safety and security, which it somewhat different. Interior lighting needs to be bright enough to be safe for guests and employees alike but also controllable so that the mood can be set. If you are refreshing the decor of your bed and breakfast and looking at new shades and fittings, rather than a complete re-wire job, look at shades that cover up the bulbs. This means that guests don't get glare from the bulbs and, if you have switched to energy saving light bulbs, covers them up, as they might be good for the planet but some are really ugly. In corridors and on stairwell the push-button time controlled switches might well save a lot of energy. These are pushed to activate then they turn the lights off again after a pre-set time. 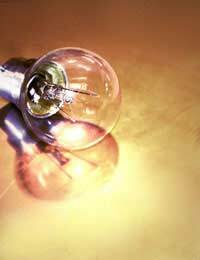 If ordinary home lighting switches are used, there is a tendency for lights to be left on all night. Dimmer switches allow guests to control their lighting requirements but are perhaps not a good idea in lounges as different groups or families may want different light levels and quarrels could break out. In bedrooms it's another matter and home lighting fittings can be used. B&B bedrooms should also have bedside lights, one for each bed or each side of a double bed. In bathrooms make sure there is adequate light around the basin as well as over the bath or in the shower area, but any fitments within reach of taps or showers have to be protected. A qualified electrician can advise on this. With regard to outdoor lighting you should make sure that paths, driveways and other access points are well lit. Movement activated security lights are good for this as they turn themselves off when no-one is moving around and save energy. Be careful that they are not too aggressive in their flood of light though, this could startle new guests and annoy neighbours, which you need on your side when running a bed and breakfast operation from home. Lighting paths with marker lights is another good idea and you should be able to find them in the home lighting section of a DIY shop. These do not spread a massive amount of light but glow to indicate where a path of driveway goes in the dark. Solar powered ones are a good idea as you do not then need to run armoured cabling through the garden from the house, so they are much simpler to install. Ambient lighting in garden, patio or decking areas is a good idea, particularly if you have a good view, perhaps facing the sunset. Guests may well want to sit outside as the sun goes down on a warm summer's evening. In this situation marker lights might be the best idea as they will not create too much background light to detract from the view. If you have a sheltered area then guests may want to stay out a little longer in which case you could have lights, perhaps attached to the wall by the house, that will spread enough light to read by, or perhaps to eat an evening meal. Don't use movement activated lights in this situation as guests will keep having to wave their arms around to turn them back on every five minutes or so. In the United Kingdom the chances of more than a few nights like that are minimal though and it might not be worth the effort of all the electrical work. Perhaps it would be cheaper to have a few storm lanterns near to hand that can be pressed into service on nights like that. If that's the case, make sure they have solid hooks to go on and they are out of arm's reach or the consequences could be disastrous. Finally, don't forget to light up your sign board outside so that arriving guests can find you quickly in the dark. Again, be careful with light overspill and don't make it compete with Las Vegas. Subtle yet clear is the message here.